It is part of the public, written record that led to the continued accreditation of the school involved: the Fairfax, Va., campus of the California University of Management and Sciences (CalUMS). The extension of the accrediting allows CalUMS to continue to operate with its 99.4 percent F-1 visa foreign-student population. The institution blessing CalUMS in this way is the Accrediting Council of Independent Colleges and Schools (ACICS), whose decision we previously reported. This report — by a university — has three misspellings in seven lines of type: "Staus", "Ethinicity", and "Promgram". Further, if "Green Card" is to be both upper and lower case, Visa should be also. It is shown as "VISA". Later in the document the word "ethnicity" appears three more times; once it is spelled correctly. That ACICS continues to allow CalUMS to operate is, at the very least, a questionable decision; all too often visa mills publish such error-ridden material. For other examples of university illiteracy, see here and here. Although CalUMS' written presentation is flawed, the math shown is highly believable. 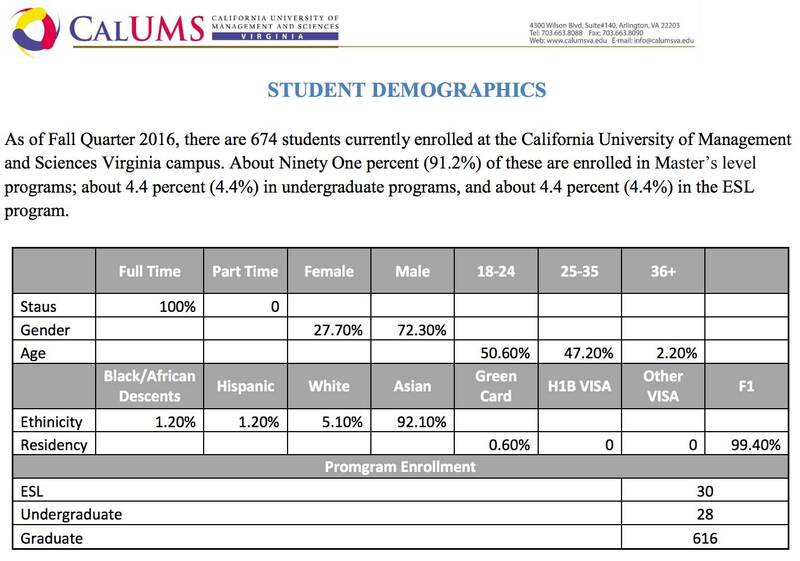 Like most institutions of its kind, CalUMS has a population of largely young, Asian, and male F-1 foreign students. The about 20-to-1 ratio in favor of grad students over undergraduates is typical, because alien grad students can, from day one, work legally under the Optional Practical Training Program, while undergraduates have to wait a year. OPT is subsidized, in effect, by the trust funds for Medicare and Social Security. Getting back to the document, maybe the CalUMS staff and management should enroll in the CalUMS ESL program.